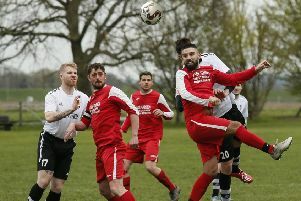 Two goals in the last five minutes saw Barton Rovers fight back from 2-0 down to earn a 2-2 draw against Potters Bar Town in their final league game of the season on Saturday. The visitors got off to a strong start as Josh Hutchinson forced home keeper Kyle Forster into a great save after only five minutes. Rovers gave as good as they got though in a combative encounter but lacked that early cutting edge in front of goal. Lucas Perry saw his tame effort go wide before a Joe Reynolds free kick sailed well over. Scholars keeper Ben Goode had a relatively quiet first half although he was called into action to push Alex O’Brien’s 20-yard thunderbolt round the post. As the action switched to the other end, poor defending allowed Hutchinson to pick up a loose ball and slot home past the wrong footed Forster to give Potters Bar a 1-0 lead at half time. Rovers came out in a positive mood for the second half but Potters Bar had the majority of the ball and could have doubled their lead when Bennett forced Forster into another fine save. Tyler Ingham had a good chance for Rovers on the hour only to fire tamely at Goode, before his side hit the self destruct button again on 67 minutes as Jack Lyons made it 2-0. With time ticking away, Rovers’ never say die attitude paid off as on 85 minutes firstly sub Ashton Grant found space in the area to fire home and give his side a glimmer of hope. Two minutes later, veteran striker Matt Nolan was left unmarked and tucked the ball home from a narrow angle to ensure Barton finished their campaign with a creditable draw. Rovers face UCL front-runners AFC Kempston Rovers in the North Beds Charity Cup final at Langford on Friday, May 6.